We guarantee that the natural turkey contained in each and every Tender & True Antibiotic Free Premium Turkey & Brown Rice Recipe pet product has been certified humanely raised by the Global Animal Partnership, a third-party nonprofit charitable organization, founded in 2008, that brings together farmers, scientists, ranchers, retailers, and animal advocates to improve the welfare of animals in agriculture. Turkey, Water sufficient for processing, Pea flour, Chicken liver, Chicken heart, Brown rice flour, Salmon oil (preserved with mixed tocopherols), Salt, Calcium carbonate, Agar-agar, DL-Methionine, Sodium phosphate, Choline chloride, Chicken broth, Taurine, Potassium chloride, Magnesium proteinate, Zinc proteinate, Thiamine mononitrate, Iron proteinate, Niacin supplement, Vitamin E supplement, Copper proteinate, Vitamin A supplement, Sodium selenite, Calcium pantothenate, Pyridoxine hydrochloride, Riboflavin supplement, Biotin, Manganese proteinate, Vitamin B12 supplement, Vitamin D3 supplement, Folic acid. weight. For pregnant and nursing mothers and for kittens up to 1 year of age feed up to 3 times as much as for adults or up to 4 cans per day. The amount of food your cat requires will depend on activity, age, environment and breed. Feed at room temperature and refrigerate unused portion in a non-metallic container. Remember to always keep fresh, clean drinking water available for your cat. 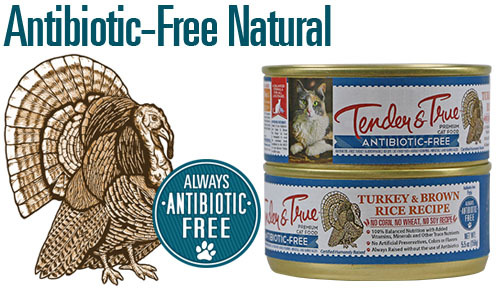 Like the natural poultry raised without antibiotics you have an opportunity to purchase from your butcher, we believe your cats deserve to receive the same high-quality, raised without antibiotics natural turkey in their pet food. That is why we created Tender & True Antibiotic- Free Premium Turkey & Brown Rice Recipe Cat Food. All natural poultry are raised without antibiotics to our exact protocols with 100% vegetarian diets and are certified humanely raised by the Global Animal Partnership (GAP). We never use antibiotics or growth hormones.